The panther chameleon, Furcifer pardalis, is one of the most beautiful and unique creatures in the world. Its full classification is Kingdom:Animalia; Phylum:Chordata; Class:Reptilia; Family:Squamata; Order:Chamaeleonidae; Genus:Furcifer; Species:pardalis. These organisms originate from Madagascar, Nosey Be, and Sambava. Nosey Be and Sambava are both islands off the coast of Madagascar. In each region the organisms differ slightly in physical attributes. In Nosey Be, males tend to be a mixture of blue and green with small patches of red, yellow, and orange. In Madagascar, they are usually green with stripes of red, orange and yellow. The least fluorescent of the species is found in Sambava. They tend to be dark green or brown in color. In all settings, the female chameleons tend to be less ornate and are usually brown and red in color. These contrasting colors are one of the many adaptations of the species. The colors help males attract mates while the brown of the females enables them to blend in more easily with surroundings and renders them less susceptible to predators since the females main job is to protect their young. Other adaptations include a hard skull almost acting as a helmet, a long sticky tongue used to make catching prey easier, and an immense visual advantage due to eyes located on the outside of their skulls enabling a full 360 degree vision. 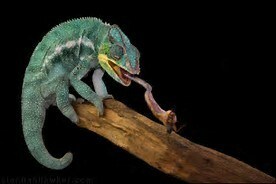 All these adaptations aid them since they are found much closer to the forest floor than other chameleon types. They are usually found in foliage of small trees instead of in taller ones. The species prehensile tail and two fingered claw like feet let this organism grip branches safely and climb much more easily than other organisms. The cover of the trees helps these animals catch their prey as well. They can hide in the foliage and use their long tongue to catch grubs and small bugs. The chameleon’s ecological niche is to control and regulate insect populations among the rainforest ecosystem. Though they prey on bugs and grubs, the chameleon is at the bottom of the food chain with many predators including snakes, birds, and even monkeys. Being at the bottom of the food chain does not result in a typically long lifespan. Most chameleons live around five years, although the males do live slightly longer than females. At the beginning of this span they start in a clutch of 10-40 eggs. A female can lay between 5 and 8 clutches of eggs in their life and usually die 2-3 years afterwards. For the eggs, about 240 days of incubation passes before they hatch and begin their lives. They stay with their parents for around 7 months then venture on their own. Thankfully, environmental pressure is not an extreme concern to their lives. They have been classified under the “LC” or “Least Concerned” category by the International Union for Conservation of Nature, due to continued conservation of rainforests. But, not all rainforests are being preserved. The ornate pattern of colors on these creatures also make them a direct target of poaching. A growing number of chameleons are being captured and sold into captivity every day. Without proper facilities and knowledge, chameleons can not receive the proper and specific care they require, To help keep them off the endangered list, people need to support rainforest conservation groups and report any illegal procurement of chameleons they might come in contact with. 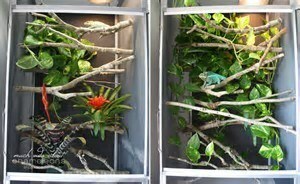 And if you decide to purchase one of these critters, make sure it is captive raised , not wild caught. At Wetlands Edge the panther chameleon lives a very happy life due to a correct habitat being created and the proper diet and conditions being met. The chameleons physical attributes correspond exactly with those that can be researched on the web. Though his behavior differs from the common descriptions. He is very friendly and not the least big aggressive like most chameleons. Unlike others of his species, he is also very sluggish instead of rambunctious. 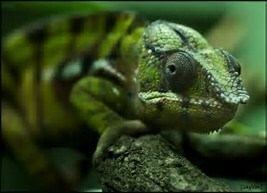 I would like to get to know the characteristics of this chameleon better through observations and research. 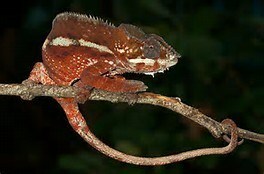 Some questions i still have are: Why does the chameleon hiss when threatened?, Can the chameleon jump?, and How long can this species hang by its tail?. I look forward to caring for this unique organism. “Chameleons.” National Wildlife Federation, www.nwf.org/Kids/Ranger-Rick/Animals/Amphibians-and-Reptiles/Chameleons.aspx. 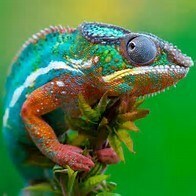 “Panther Chameleon.” Animal Spot, www.animalspot.net/panther-chameleon.html#Meanings_of_Color_Changes. Animal-World. “Panther Chameleon.” Animal World, animal-world.com/encyclo/reptiles/lizards_chameleons/PantherChameleon.php#Habitat: Distribution/Background.